What’s New & Exciting on our Wellness Website? At Wellworks for You, we’ve been developing our wellness website for several years and are continually seeking and implementing new ideas to make it the best wellness web portal in the industry. Our newest changes include several unique additions that we think will benefit all of our current clients and future clients alike. Many of our business practices are founded on the word “customization.” We make it a point to make every single wellness program we develop unique to each particular client. In fact, we believe that’s the only way for a wellness program to be truly effective. We’ve now taken this idea of customization into our wellness website and created an interactive portal that our clients can edit and fully customize to fit each of their needs. On the new site, users will be able to decide which pages to hide and show, depending on which ones are important to them at any given time and correspond to the specific parts of the wellness program they are choosing to offer at their place of work. To further customize the look and feel of the portal, we have developed new design schemes that clients can choose to change colors of texts, headers, calendars, etc. Having a customizable wellness website will prove to be a motivational tool for participants of corporate wellness programs. The individualized nature of every employee’s portal will allow him/her to quickly view the information needed. Our web portal acts as a free storage unit for clients’ resources, metrics, documents and results as well as a place to input and keep up with new information. Since much of this data changes from person to person, it only makes sense for each of our clients to have a customizable portal! Our wellness website team has also been busy creating a state of the art wellness portal app for smart phones and are excited to announce its arrival! This app is compatible with both Android and iPhones and offers all the benefits of the online portal right through your smartphone! Need to look at a recipe, update records or share a grocery list? Now you can with the touch of a finger! Are you involved with our pedometer program? It just got even easier….our smartphone app allows your phone to act as your step counter and gives you easy access to tracking your progress, creating maps and setting goals. Several more exciting developments are currently in progress on our wellness website. Stay tuned for more information on the coming “Coach’s Corner.” This area on the site will allow clients to connect with health coaches and personal trainers to schedule meeting times and places and track progress. 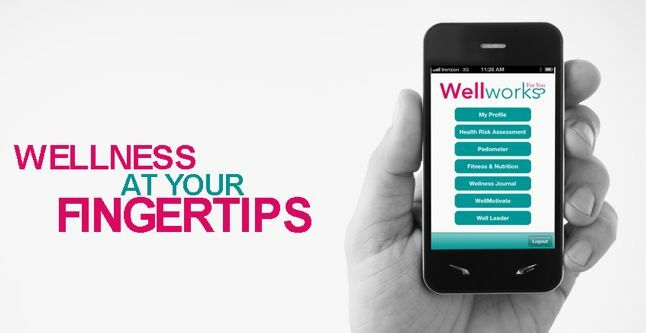 We believe this new feature will really help employees reach their health goals with the encouragement of professionals – all right through our easy to use wellness website! Do you have more questions about our wellness portal or how your company could put it to use in your own wellness program? Call us today or download our new, free ebook A Wellness Portal Overview: What It Is & Why You Need One.